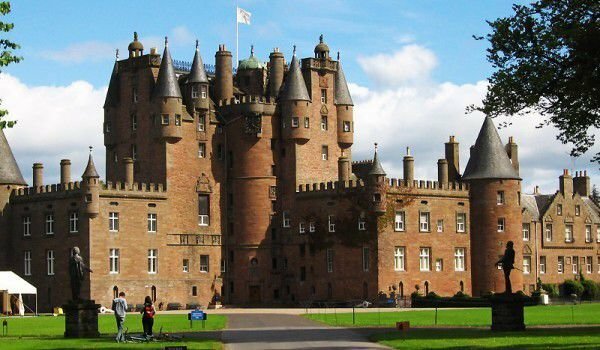 Glamis Castle is one of most mysterious of all being wrapped in mysterious stories of ghosts and spirits. This otherwise remarkable and beautiful palace is located about five miles south of Forfar in the Scottish county of Angus. Glamis Castle and Hermitage Castle held the championship in ghostly palaces. The history of the castle Glamis began in the 14th century. It was a mansion for the Bowes-Lyons family, which was given to them as a gift from Robert Bruce of the Family in 1372. Bowes-Lyon still have the castle from descendants of the Earls of Strathmore. In the stone halls of the castle was born the already late Queen Mother Elizabeth Bowes-Lyon and Princess Margaret. In 1372 the Scottish King Robert II was officially announced Sir John Lyon of Glamis which had previously been used as a royal hunting lodge. Four years later Sir John married the daughter of Richard II, Joanna, who was appointed royal governor of Scotland. Their descendants today still live in the mansion. Their grandson became Lord Glamis during 1445, and the title, Earl of Stratmor was formed in 1606 and then the title of Earl of Kinghorn and Stratmor - in 1677. 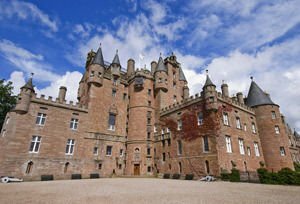 The main stronghold of castle Glamis was raised somewhere in the 14th century, and many majestic towers and turrets were added in the coming years and centuries in which palace had suffered permanent repairs. Glamis is designed in the shape of the letter L, as its rooms are divided into five floors. Stories about the ghostly castle Glamis are not only one or two. One of them tells of the Earl Baird, the fourth Earl of Crawford, playing cards with the devil in a room of Glamis Castle. According to other legends Shakespeare personally visited the palace and described it in his famous work as the tragedy, Macbeth. The most primordial appall story about the Glamis Castle began in 1034 when King Malcolm II of Scotland was savagely murdered in the castle. The legend tells that the blood of the victim from the cut body seeped into the floorboards and was kept until today in the so-called Malcolm room that the ghost of the King visited. To this day, guests of the castle complain or praise of waking up at night by a mysterious knight in armor. Today there is a possibility of the halls of Glamis Castle to be rented for private parties and celebrations. Inside there are four shops and a restaurant. Part of the premises of what you can enjoy are the beautiful room, sinister basement, fabulous hall for receptions and celebrations, private chapel which was used by the Queen Mother daily. Glamis had built an incredibly beautiful park and Italian garden. There you may also see some statues of kings, telling the history of the country.